The late Rev. Warren H. Dolphus was born in Camden, New Jersey but maintained Georgia as his home of record. With the strategic support and assistance of his wife, Addie, he founded what has become the National Alliance of Faith and Justice (NAFJ). During the 27th Annual Conference and Training Institute of the National Association of Blacks in Criminal Justice (NABCJ) in Atlanta, Georgia (July 2000), Rev. Dolphus introduced the workshop which launched NAFJ's inaugural concept, Facilitating Assistance in Transition and Healing (F.A.I.T.H.). The concept became a multi-year national initiative adopted by NABCJ. This workshop launched NABCJ's efforts to increase the involvement of faith as an asset to the criminal justice community. Consequently, in January 2001, he was appointed by the President of NABCJ, Mr. Matthew Hamidullah, to serve as the first Chair of the NABCJ's new National Religious Affairs Committee to carry out the concept's principles. The volume of work performed by the committee resulted in a mutual decision to expand the work from a committee into an operational body, the National Religious Affairs Association (NRAA), NABCJ's first affiliate. During his lifetime and prior to his retirement, Rev. Dolphus' served as a chaplain of the Federal Bureau of Prisons. In addition, he served as a consultant for Court Services and Offender Supervision Agency of the District of Columbia, the National Crime Prevention Council, and other federal agencies. Rev. Dolphus served on the board of several national organizations to include Horizon Communities in Prison, the National Crime Prevention Coalition of America and Youth Action Network of Central Florida. He also served on the African American Advisory Council for Big Brothers Big Sisters of America. Rev. 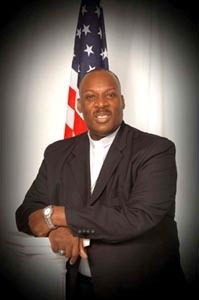 Dolphus earned his Masters of Divinity Degree from the Interdenominational Theological Center (Turner Theological Seminary) in Atlanta, Georgia in 1993. He also held a Bachelor of Science Degree from Wayland Baptist University in Plainview, Texas. On February 18, 2007, at the age of 49, Rev. Dolphus transitioned from this life and leadership. The national board and officers of the National Alliance of Faith and Justice as well as thousands of men and women benefitted from his vision and leadership. Along with his wife and his two daughters, we unite in mourning his loss.